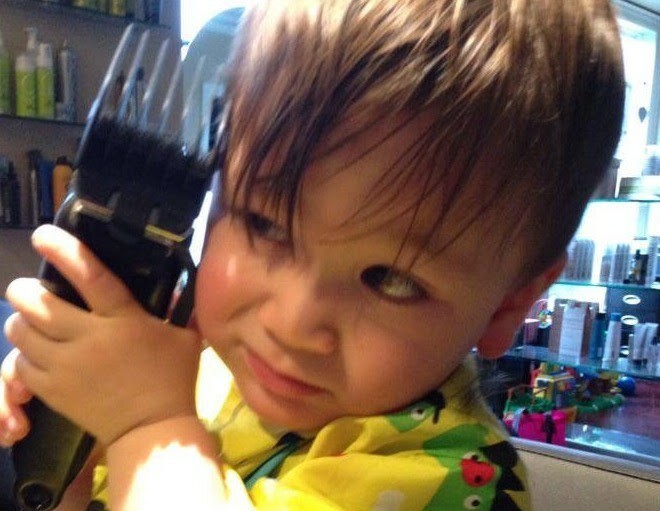 Believe it or not, children’s first haircuts can be pretty traumatic experiences. A piece of them is literally being cut away from their bodies and to an innocent little munchkin with no concept of how harmless the process is, this can be both frightening and extremely stressful. It’s always best to plan ahead for the big event and take the proper measures to ensure baby’s first haircut is as pleasant and comfortable as possible. It could be the difference between a kid who loves getting a haircut and one who loathes it. • Brush your baby’s hair and touch her headoften at an early age. Advance preparation is key! The more you touch her the less likely she is to react negatively to a stranger touching her head and hair. It also helps to hold her bangs between your fingers and even play with combs, brushes and spray bottles at home. Find a story about having a haircut. Get her excited about it! • Familiarize your baby with the experience and the environment. Before getting his haircut, bring him to see haircuts often (yours, friends, family members) and talk himthrough the process. Show him that it can be a fun, interactive experience (that doesn’t hurt). Eliminate any surprises. Also (and this is important), make sure you visit the salon you will be taking him to and introduce him to the stylist. You’re setting yourself up for disaster if you take him somewhere unfamiliar for the inaugural haircut, with new smells, sounds, people and a complete stranger touching him and bringing scissors near his head! • Try to avoid using the word CUT. We constantly tell our children to be careful, thatwe may get hurt or CUT with sharp things like scissors. CUT is a harsh word and often used in a negative context, so it should come as no surprise that a haircut (using scissors) in a child’s mind is a scary thing. Use words like trim or snip and phrases like “we are going to tidy your hair”. Make sure to tell the stylist what word you use so he can avoid the word CUT as well. • Go when you think your baby’s ready. There’s no right or wrong time to start getting haircuts, however I recommend early even if it’s just a tiny trim off the back or the fringe. Get her used to the experience before diving into a full-blown haircut. • Do your research. Pick a place that is good with kids (this may not necessarily be a kids hair salon). Ask around for where people take their kids and what their experience is like. Remember – other parents are your best resource. • Book a good time for your child. Not during times of day where she is typically hungry or tired. The first appointment of the day is often good, as you avoid delays from other customers. • Have him choose a toy to bring to keep him occupied. Try to make it something that you don’t mind getting hair on. • Bring a secondary shirt. Many children do not want to wear the capes and if they do they still may get itchy hair on them, which can lead to grumpy, uncomfortable tykes who don’t like getting their hair cut because it makes them itchy after. • Be ready to wear the cape and have your child on your lap – she may need the comfort of having a parent holding her in order to get over the initial fear. Remember: you’re her most dependable safety blanket. • Stand in front where he can see you and interact with you. You are a familiar source of comfort to him and could provide him with a valuable distraction (which the hair stylist will appreciate). • Be prepared to take evasive action! You may need to turn your child away from the mirror. It’s nice to try to get her to look at herself, but remember: someone they don’t know is standing behind them with scissors so they will often be trying to turn to look at what is going on behind them. We want to avoid scalp-related flesh wounds! • Finally, make it fun! Bring along another adult to take pictures. Make the first time as enjoyable and interactive an experience as possible. Be excited for them. If you are apprehensive or nervous they will sense that and feel the same. Tell them how great they are going to look when their hair is all tidy. Eventually, your child will automatically associate hair cutting with a good time and look forward to going to the salon. Remember that no child is the same. At the end of the day, you know yours better than anyone else, so decide for yourself which of the above tips work best for you.